^ a b Krebs, Gunter. "Titan-2". Gunter's Space Page. Retrieved 2009-04-29. ^ Kyle, Ed (2009-04-14). "Titan 23G Data Sheet". Space Launch Report. Retrieved 2009-04-29. ^ Wade, Mark. "Titan". Encyclopedia Astronautica. Retrieved 2009-04-29. ^ Kyle, Ed. 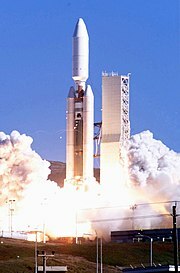 "Titan Launch History". Space Launch Report. p. 3. Retrieved 24 January 2014. ^ Wade, Mark. "Landsat 6". Encyclopedia Astronautica. Retrieved 24 January 2014.